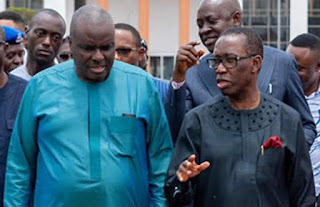 Delta State Governor, Ifeanyi Okowa , has thanked former Governor James Ibori for supporting him to victory. Okowa described Ibori as his leader who has always stood by him. I want to appreciate my leader, former Governor James Ibori for his encouragement, support and all he has taught me all through these years. Okowa , who is a member of the Peoples Democratic Party , got 925 , 274 votes to defeat the All Progressives Congress candidate , Great Ogboru , who garnered, 215 , 938 votes.